Earlier this week we had the pleasure of stopping by FigLeaf Brewing Co., to talk about their big upcoming anniversary party. In between sampling tasty beers, we talked about their bridging the gap between Cincinnati and Dayton, how distribution is working out for them, their wealth of beer styles and so much more. Don’t forget to bookmark their anniversary party, and we’ll see you there! Plus you can check out all our shows at our Brew Minds page on YouTube. 3-years ago Bryan Roth from This Is Why I’m Drunk reached out to local bloggers across the country to each build a 6-pack that represents their state. You can read that list here. About a year before that post I wrote another article on the Cincinnati Six-Pack. Both of those lists are now hilariously out of date. The best example of this is that Rhinegeist isn’t on either list as they weren’t open yet. I initially sat down to write an update for Ohio’s part in the Six-Pack Project but remembered the difficulty in narrowing an entire state down into six beers. So, I decided to settle down to just a Cincinnati Six-pack, plus a few from Dayton. I also reached out to Pat at Pat’s Pints in Columbus and Rick Armon at The Ohio Beer Blog in Akron/Cleveland. They’ll both be doing similar posts covering their parts of Ohio in the next few weeks. I normally leave event coverage up to BrewProf.com and his awesome event calendar but I do want to cover awesome events and the Brew Ha-Ha is shaping up to be amazing. The first two things you need to know are that it’s a charity event and it’s only Ohio beers! Calamity Dawn and Dorian Bridges are: Calamity Labs! It is hard enough keeping up with new breweries, distilleries, and bars opening in Cincinnati. Trying to keep a handle on what is going on in Dayton seems like just a little too much to ask these days. Luckily, I have a couple of friends in the area who invite me up when things get interesting. Calamity Dawn and Dorian Bridges are the geeky bar-tending duo behind Calamity Labs. Together they roam the Eastern United States bringing booze, informative panels, and killer room parties to steampunk, comic, gaming and various other conventions, as well as doing private events. I got to know them during my misspent years with the steampunks. Calamity was one of our first guests on The Charlie Tonic Hour and created our official cocktail. I have followed the development of Calamity Labs as they have gone from doing panels at regional shows to leading presentations at DragonCon and competing and placing in The Bourbon Social Cocktail Competition. On Tuesday they hosted a test run of the latest panel that they will be presenting at shows this spring, Mixology 320: Mixology in Motion and they were kind enough to invite Charlie and I up to participate. The three competitors wondering what the hell we got ourselves into. The event was hosted by Stillwrights Spirits at their Flat Rock Distillery in Fairborn, Ohio. Stillwrights has only been on the market for the past four months but Calamity Labs became fans right away. I was thrilled to be able to combine a trip to see friends and experience a fun night with learning about a new distillery that I didn’t even know existed. Stillwrights primarily makes flavored moonshine but they have a straight moonshine, bourbon and rum as well. One interesting thing about this distillery is that the owners were in the machine business before starting the distillery and were actually able to fabricate their own still. In addition to the traditional moonshine flavors I was excited to try some of the more tropical flavors they had like Margarita and Key Lime Pie. You can do a tour and tasting there on Saturdays for $10 so if you are in the Dayton area I encourage you to stop by and check them out. The winning cocktail. It wasn’t mine. The panel itself was a lot of fun. After a brief intro about the distillery and the basics of cocktail making, three audience members were chosen to go up to our mixing stations and were given twenty minutes to create an original cocktail recipe. I was able to compete and decided to play it safe by mixing ginger beer and grapefruit bitters with the Stillwrights Peach Cobbler Moonshine. Unfortunately for me, Calamity Labs rewards boldness and innovation, plus I over did it with the ginger beer a bit so I did not win. I did however, have a wonderful time. I think everyone learned a lot about the subtle art of cocktail creating. Along the way we were able to try a skill that was out of our comfort zone, and I got to see several good friends that I hadn’t seen in a long time. If you want to learn more about Stillwrights or Calamity Labs they both have Facebook pages you can follow and you will find Calamity Labs at a variety of conventions in the coming year. You can hear more about the panel and our interview with the owner of Stillwrights on Episode 151 of The Charlie Tonic Hour. Word hit the net Tuesday about what states and stores would be getting the highly acclaimed and hard to obtain Westvleteren XII (aka Westy 12). I’ve done the leg work for you and contacted the retailers in the Greater Cincinnati are that’ll be getting this. Before we get there let’s talk about what the heck Westy 12 is. An Ohio Vodka meets an Italian Vermouth and they make sweet beautiful love together. The following post first appeared on January 18th on The Charlie Tonic Hour. I am sitting here at my computer, having just finished recording episode three of The Charlie Tonic Hour where we reviewed the locally distilled vodka, Buckeye Vodka. I am still a little tipsy from the tasting and I am feeling such a pleasant buzz that I thought I better record my thoughts before this delicious feeling passes me by. Charlie and I went into the local liquor store to buy some vodka on a cold Saturday night. We were just planning on getting something cheap since we were going to be mixing it but Charlie is a Skyy man and he was leaning toward that. The guy behind the counter suggested that instead we try a local vodka, Buckeye Vodka, because it was only two dollars more and it had recently won a gold metal for exceptional quality at a world competition in Chicago. Well it’s not often that I am able to drink a gold metal winning vodka, let alone one that is made in my home state, so I had told Charlie we should go for it. The very helpful young man assured us that we would not be disappointed, noting that it is distilled 10 times, filtered five times, and is incredibly smooth. After four I’m under the host. Buckeye Vodka is made near Dayton. Ohio. Despite being less than two years old the vodka has done well in international competitions. Dayton isn’t the first rust-belt city hit hard by the recession to be making a name for itself in the micro distilling field, lately Boyd and Blair have been getting rave reviews with their potato vodka made near Pittsburgh, and I am thrilled to see this trend continuing in Ohio. Now that’s an economic recovery plan I can fully support. Charlie and I do not have any kind of training in tasting alcohol; we are nothing more than enthusiastic amateurs when it comes to our booze. So we decided to try the vodka straight up as a shot, not chilled at all, and then in the martini. Upon first taking the shot Charlie and I were both surprised how smooth it was. No grimacing or coughing here, you can drink it nearly as easily as water. That has not been the case with any other vodka I have tried. After that I was very excited to try the dirty vodka martini I was mixing up. Despite loving the name and the lore of the martini, H.L. Menken called it the only American invention as perfect as the sonnet, I’ve never warmed to the gin version. I had a feeling that I would enjoy this one a lot more and I was not disappointed. 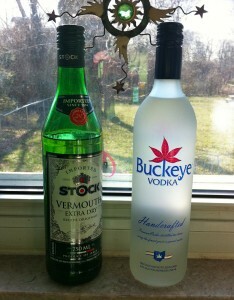 Good vodka should be clean and smooth and Buckeye is definitely that. The martini had a light, crisp taste that was incredibly pleasant. And speaking of incredibly pleasant, the buzz from these drinks was a light, sparkly feeling. It had a crisp, almost energetic quality that suddenly made the three-martini lunch seem like a sensible business decision. Of course good taste and a pleasant buzz are all well and good but can you afford to drink it? Well of course this isn’t the cheapest stuff you are going to find out there. But it is exceptional value for your money. At less than $20 for 750 ml, Buckeye is at least $10 cheaper than the well-known premium brands like Grey Goose and if you are an Ohioan you are supporting local jobs. Unfortunately Buckeye Vodka is only available in Ohio right now but if you are passing through the state I highly recommend you pick yourself up a bottle. You won’t be disappointed.